Rock the Vote, and dance too! Fall Out Boy isn't backing down from politics on their upcoming album, Folie A Deux, due November 4 on Island Records. "Yes, this is a political record," says singer/guitarist Patrick Stump. "But it's a political record only insofar as anyone making music and paying attention to what's happening will make a record tinged with politics. You can't ignore it." Fall Out Boy played last month's Democratic National Convention in Denver, and is hooking up with Rock the Vote until the election in November. At the Convention, Stump says the band kept its official comments nonpartisan. But off the stage he doesn't hesitate to say that Democratic presidential nominee Barack Obama "is the most excited I've been about a candidate." 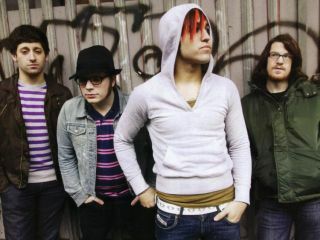 Bassist Pete Wentz, however, is more elliptical when describing the thematic content of Folie A Deux. In his view, the record contains more "outside perspectives" and "fictionalized accounts" than previous efforts. "I'd rather let the listener interpret them," he says. "Every time you think we're talking about a girl, we're not, and every time you think we're not talking about a girl, we are." Lyrical intentions aside, Stump insists that their main focus was on music. "I felt frustrated with the last record because my voice was the focal point for many of the songs," he says. "When we were writing this one, we wanted it to be about all the parts coming together to form a whole." MusicRadar was recently treated to an advance sneak of one untitled song that is a veritable hip-shaking hook-o-rama of massive proportions. Politics be damned, this thing cooks! Be ready for it.